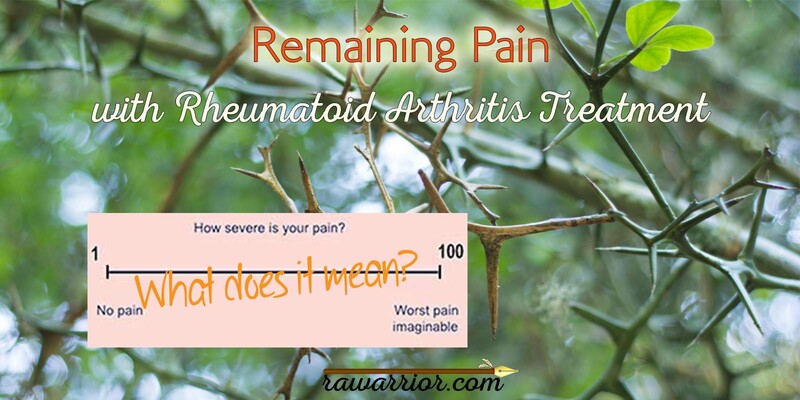 Remaining pain with Rheumatoid Arthritis (RA) has been a topic on RAW since 2009. We’ve discussed how people manage the common “leftover” symptoms such pain, fatigue, and stiffness while being treated for rheumatoid disease. Leftover or remaining pain is the subject of an interesting abstract reported at the recent American College of Rheumatology scientific meeting. A total of 1241 “early RA” patients were studied via the Swedish Rheumatology Quality Register (1996–2010) as follow up to the Epidemiological investigation of RA (EIRA) cohort (1996–2009). “Remaining pain” was defined according to a 100 mm visual analog scale (VAS) above 20 mm 3 months after initiation of methotrexate monotherapy. Remaining pain with Rheumatoid Arthriits was observed in 57% of patients at 3 months. 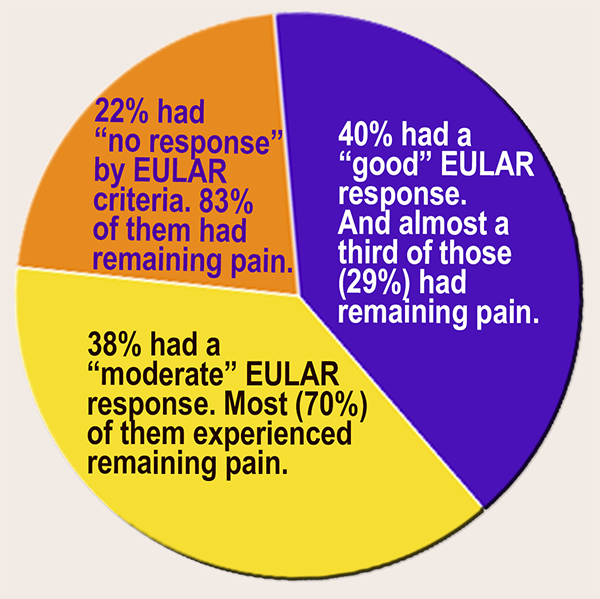 Investigators grouped responses and frequency of remaining pain according to “good, moderate, and no response” EULAR response criteria using DAS28. DAS28 includes a count of 28 joints for tenderness, 28 joints for swelling, an erythrocyte sedimentation rate (ESR), and patient’s global disease activity measured on a VAS. EULAR response level depends on DAS28 improvement for a particular level of disease activity (see screenshot from DAS-score.nl). Most “early RA” patients continued to experience pain even with a DAS28 “EULAR response:” Frequency of EULAR “good,” “moderate,” and “no response” was 40%, 38%, and 22% respectively, and in these response groups, the frequency of remaining pain was 29%, 70%, and 83% respectively (see pie chart). An increase in pain was seen in 19% of patients during treatment, and frequencies of increased pain were 9%, 15%, and 45% respectively. What does it mean if a majority of patients have remaining pain with Rheumatoid Arthritis? The first thing to do is look for things that associate with the remaining pain in order to understand it. As a patient-researcher, I’ve done some qualitative research in this area. In most people with Rheumatoid Disease (PRD), pain does not occur in isolation, so I tend to favor the first option below. Possibility #1: The conclusion you’d come to if you just observed patients and their descriptions of their disease activity: Remaining pain is part of residual disease activity of which many PRD are aware. Treatments developed specifically to lower certain indicators such as sed rate (ESR) may be successful in doing so, but do not usually dampen all disease activity to the point that a PRD feels perfectly normal with regard to symptoms. Even PRD with good responses to treatments typically still live with RD; i.e. they make certain adjustments in life, take symptom-treating medications, live with some symptoms, and experience consequences after activities. KEY POINT: Just as we’ve begun to clearly acknowledge Rheumatoid Disease activity that is extra-articular, we are also bringing recognition to musculoskeletal disease activity that is ignored when disease activity measurement is limited to synovitis (joint pain and swelling). This suggests the frequently cited non-inflammatory pain, “fibromyalgic pain,” chronic pain syndrome, phantom limb pain, over-focusing, catastrophizing, hypochondriasis, etc. explanation for remaining pain. The first problem with this hypothesis is that the study showed MOST PRD experience remaining pain after treatment, not a small subset. Another study, referenced in this one included 2800 adults from Europe and the U.S. with self-reported RA in a survey by internet, patient databases, and word of mouth. The majority said their RA was “somewhat-to-completely controlled,” and of those patients, most (75% in the Europe and 82% in the U.S.) reported having moderate to severe pain within the previous two months. A second problem is that inflammatory activity as an explanation for remaining pain was not ruled out by the use of expert musculoskeletal ultrasound, or other method. Third, the assumption that PRD with lower ESR are not experiencing inflammatory disease activity has been shown to be false. About 40% of PRD have normal ESR throughout the course of their disease. [3,4] We have seen this in our community repeatedly, even while damage occurs. The higher HAQ scores in this group also point to musculoskeletal disease activity that is not being recognized. What can we do about the problem of remaining pain with Rheumatoid Arthritis? 1) Remember that for people living with Rheumatoid Disease (PRD) pain is seldom an isolated symptom; it’s not just pain. Patients should specifically describe symptoms and how the disease is affecting them. Doctors should put more weight in patient experiences than lab tests. 2) Support the patient-led research of the Rheumatoid Patient Foundation. Note: Rheumatology Network interviewed Swedish investigator Jon Lampa in the video below. This “continued pain issue where nobody listens” has been an issue for me since I got diagnosed with RA in 2008 at age 28. I still do not test positive for Rheumatoid Factor, but I still have a very aggressive form of the disease. After blazing a trail through Arava and Humira with little improvement and lots of side effects, I’m now on Orencia, Arava, & Plaquenil. While my rheumatologist seems to think my RA is doing great & sees no signs of inflammation in my joints in my feet (my biggest problem area), I still have trouble with pain. Somedays it’s hard to walk almost like a flare, but there is no heat around the joints. The doc says I have developed osteoarthritis now in my feet as well. “Take Tylenol,” really? I feel like there might be some thing I’m missing. thanks for sharing Holly. These are the kinds of challenges that need to be sorted out one by one, listening carefully to the patients’ symptoms & testing where needed. One size does not fit all. Do we have the same Doctor? My Rhuemy, just last week, told me that I am at low risk for deformities because I am Rhuematoid Factor Negative. This was just after I showed her new bones popping out at my thumb joints, and telling her I still can’t walk very far ( like a small block ). She looks at my hands and says it is OA , not RA, and that includes my feet. She shows me the X-Rays that were taken a year ago, see, no erosions, you have OA. My last Rhuemy told me I had erosions, and showed them to me. The 16 months that I have been seeing her I have blown through two biologics and started # 3 just this week. At first I thought she was great because she would change my meds quickly, but now I have BIG doubts. I don’t really understand how this could suddenly be OA, and I told her no Doctor ever told me I had OA before. Yuk. Haha Lynne, maybe we do have he same doc!! The switching of biologics is kinda scary. I don’t like it when she switches my meds a lot, but I also get irritated if she doesn’t change anything when I tell her my symptoms have changed. You know, she hasn’t done any xrays on my feet since she first diagnosed me 5 yrs ago? Hands yes, but not feet. Like you, I’ve got new bone growth there too, and my toes are starting to bend to the outside of my feet! These crazy docs I tell ya! I feel like sometimes the stress over treatment, Doctors, meds, side effects, remaining pain, is hurting me as much as the disease itself. I get so tired of trying to let the doctor know how my body feels. She sometimes makes me feel like I am imagining it all. AAAARRRGGG!!!!!!! Another very helpful & informative posting — so thankful for Kelly, the RPF and RAWarror site! Think about it for a moment–our success in changing the way the medical establishment views and approaches this horrible disease is directly proportionate to how much we as patients, caregivers, doctors and others are willing to support the RPF by making generous contributions — either annually, quarterly or monthly basis. No amount is too small or too big, and it’s easy to become a member (click through to membership page.) Happy Thanksgiving to Kelly and all fellow warriors! Thank you for sharing this information. 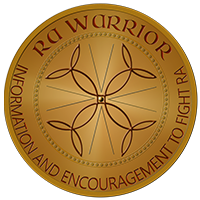 It, like much of the information shared on your site, helps me understand my RA experiences. This is exactly were I am at. I was diagnosed this summer at age 34. I have been on methotrexate for 3 months which thankfully has relieved the severity of pain, stiffness, etc. but I still have a lower level of pain, stiffness, and inflammation. At my last appointment the nurse seemed puzzled by this so she prescribed sulfazine to work with the methotrexate…maybe I should print off this article and take it in with me next time. I am waiting to try it until after Thanksgiving since the side effects sound particularly awful. 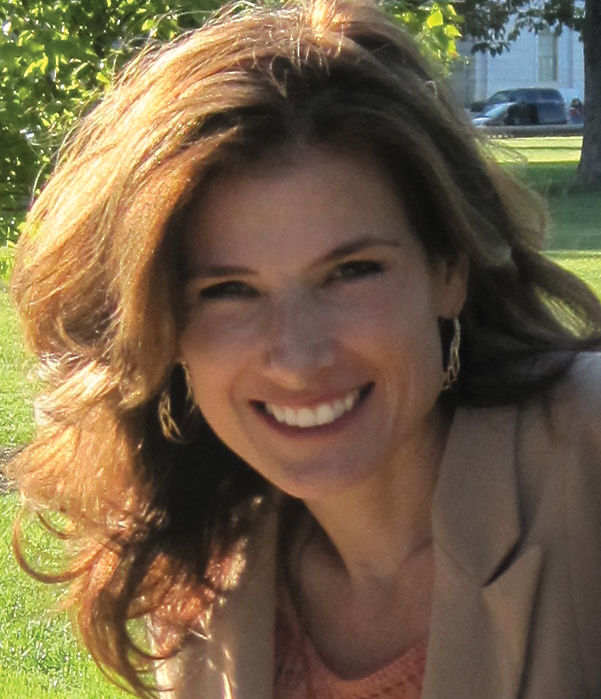 Thank you Kelly for your time, energy, and passion that you put into this blog. Many times, like this post, I check it and there is information pertaining directly to my situation. Since my treatment team is not overly forthcoming with information I have relied on this site and others to help me educate myself and navigate this disease. What if inflammation is a symptom of the disease process, and not the disease itself? Steroids, anti-inflammatories, and DMARDs (despite their name) help control inflammation, but don’t do so much to actually slow or halt the damage. (Biologics do seem to slow the disease, but that’s another topic.) Blood tests look better, visible swelling looks better, but what’s actually happening to the tissues maybe isn’t a whole lot better. If most of the pain is from the tissue damage rather than the inflammation, there’s the source of the cognitive dissonance present in the “But you don’t have any swelling and your ESR is normal” comments. you’re right there’s a lot to sort out here – part of it will become clear as we understand the disease processes better. In watching patients (& my own experiences), pain & disability can come literally overnight. And can also leave as quickly when the right treatment is found, even in long-standing disease. So, I’m not sure if “damage” is the cause of most pain and/ or function loss. But you have hit on an important question. I do think we are in a sense treating a part or symptom of the disease and that there is a physiological reason for remaining pain (at least 99% of the time). AND, we only admit to clinical trials those with higher blood test results, so we are also possibly designing medications that treat those phenotypes and/or symptoms more successfully. Lots to think about. Thanks for adding to the discussion. 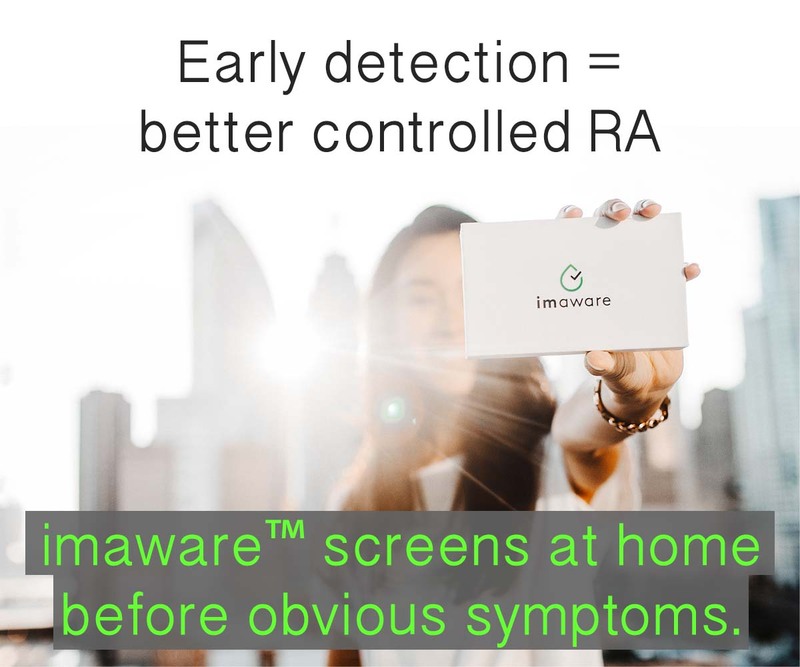 You are absolutely correct in saying ESR is normal in a large percentage of people with RA so it cannot be used AT ALL to monitor disease activity or inflammation. The authors did not indicate if advanced imaging was part of their monitoring of disease activity but it is unlikely because it would have been mentioned in the Methods section. What is not clear is exactly what the authors mean in their conclusion by “non-RA causes for remaining pain”. It is really poor science to reach this conclusion when faulty methodology is used. In your “what can you do” section, you mention a few suggestions. What I’d like to propose is that the RPF have a sub-committee or group of people with scientific and research expertise who will begin to write critiques of these research studies. These critiques can and should be sent to the authors first and foremost, to leading rheumatology journals, to Rheumatology News and other public forums that rheumatologists will read. The reason it is important to send a critique directly to the authors is because they have a registry in Sweden following several thousand people with RA. We might have a positive impact on future research that definitely is being planned for this cohort. It is a very very simple matter (as you have so thoroughly done in your blog post) to find the errors in these studies. I believe we have a responsibility to address these faulty studies that continue to perpetuate myths about people with RA. Thank you for taking the steps you do that continue to push for scientific rigor and better research in rheumatology. The state of the science and the art is somewhat of a disgrace !! I have a mystery. I was diagnosed 6 months ago. I’ve gone from 20 mgs of prednisone a day to 5 mgs now. I got down to 2.5 mgs, but my swelling came back. So my rheumy took me from 20 mgs of MTX a week down to 16 mgs and told me to go back to 5 mgs of prednisone a day. She authorized Humira which I got about 3 weeks later. It took nearly 3 weeks for the swelling to go down. 6 days after my 1st and only Humira injection, I got a sinus infection that I’m still dealing with 1 month later. My rheumy took me off MTX and Humira immediately and left me on prednisone. Here’s my mystery: I’m feeling close to my old self again, just some twinges in joints that go away quickly. I’m sleeping better but still have low grade fevers. I’m concerned that Humira will make me sick again and I’m self-employed. I don’t see that not taking MTX has changed anything. I’m wondering if the medications are worse than my disease level at this time. I meant to thank you for this website too. It has been a life saver for me. I crave information and explanations. You do both very well. Thank you for all of us, particularly those of us who are newly diagnosed. Hi, Holly! I read your posts and also have residual pain. I have RD and OA in most of my body. I, too, have bad allergies and am prone to sinus infections, but luckily live in the Florida Panhandle so I don’t deal with a lot of extreme weather, but there is rain and it does get in the 30’s in winter. I just started Orencia infusions. My 3rd loading dose is Tuesday. I am heading to the frozen North for Christmas. Any suggestions or tricks you’ve learned to deal with the pain and to avoid the infections? Any advice from anyone with experience in this area is welcome. We leave in 6 days and it’s a long drive when your back, hips, knees, and feet hurt all the time. I have to say, having read this blog for several months before my diagnosis, knowing that the likelihood of pain going completely away was low has had an effect on the way I manage my disease. I think it changed my expectations, for one thing. I’ve spent more time trying to make sure I think about the things I can do, and less time worrying about the way I feel. The remaining pain and its partner, fatigue are things I would like to get rid of, I don’t think it will happen with the current state of medicine. I do think I can agree to both support research, but at the same time be fairly satisfied with my current state of being. I don’t think people’s remaining pain is in their heads, however I do look at the possibility that I can think I feel worse, and make myself worse than I am. Stress is bad so I have to work on my attitude and coping mechanisms daily, and it isn’t something I gave much thought to for forty years, so it takes some effort. Even while we spread the word that the treatment options currently available, and the doctors who prescribe them, need to encompass the whole patient, your blog does help make people aware of some of the things they may face, and it helps them to deal with it. Knowledge is power. Thank you again for all you do, Kelly. Today my pain is not imaginary! I am 1 week from my 3rd loading dose IV meds and I feel like I’ve taken 10 steps back. My fatigue, swelling and joint pain are so bad and I am depressed because we are less than a week from Christmas. I need some encouragement big time! this was a topic of discussion I recently had with Dr. C, his explanation is that there is pain from inflammation ( active disease activity) and pain from previous destruction. The disease activity needs to be addressed with DMARDS and biologics while the disease previous destruction is treated separately. Even with remission there is pain from previoud joint destruction. We haven’t found my magic combo yet but at least I have a doc that is trying! Of pain that I must push thru daily to function. It doesn’t come and go. The only thing thay changes is the intensity of it. So for 30 plus years I have dealt with this thru a variety of rheumys. Thank you for this website and all of your opinions. I really just want to know why! Or what’s on the horizon as far as research. A good example of what I have tried… Paleo diet and no gluten and no sugar. Felt noticeably better with pain at a low level for the first time in a couple of years. Lasted six weeks and without anything changing on my part, wham! Pain racheted up about five notches and has stayed that way for weeks now. Humira ( current med) and other meds I have taken like remicade have kept me from having the horrible out of control flares that come and go but have left me in a more constant but bearable pain. Sharon, your experience reminds me there have been studies that show any drastic change in diet can shock the immune system to sometimes improve rheumatoid symptoms temporarily. If symptoms return, then obviously that’s not the complete answer – true for most people. I’m sorry you’re in so much pain with little relief. It’s hard to live with year in and year out trying everything. I hope you can get at least some pain relief, whether it’s prednisone, injections, massage, pain medication, or therapeutic doses of nsaids… there are options & I hope something can help. 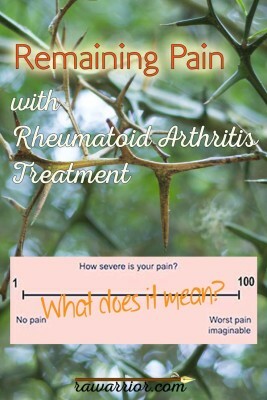 Here are some more discussions on RD pain http://www.rawarrior.com/tag/rheumatoid-arthritis-pain/ For me, I finally got a splint for a wrist that constantly hurts & that helps the pain – now to find something for a dozen other joints that won’t shut up. It’s a constant process. Kelly, thank you for responding. Just having found your site has helped my mental state! I am better when I am determined to push on and angry at my RD rather than the little pity party that sometimes creeps in lol Over it! And moving on! Keep informing us… It’s what helps the most. OK so it’s NOT in my head 🙂 My primary Dr won’t touch the industrial strength pain meds (long story) but at least she reffered(sp?) me to a pain management Dr. Historically Codine based pain meds don’t do a thing for me (cyp2d6 deficiency?). When you tell that to a Dr they treat you like an addict. When I showed my pain Dr the list of what DIDN’T work, he put me on 30Mg of long acting Morphine with 30Mg of Short acting for breakthrough pain. Well I went through a rough stretch and found out that I couldn’t take much of the short acting w/o side effects (couldn’t sleep, jumpy, etc). He switched me to Nucynta and it doesn’t present the side effects. My question is should I ever expect to be pain free, or just accept the 90% solution and drive on…..? My last visit with Dr C we had this very discussion – what is exactly this pain? His theory is this pain is caused from damage already done by the RD. The biologics and DMARDS work to ease pain associated with active RD and opioids and other chronic pain treatments are needed to manage the remainder. I think this theory is not good for patients. It has logical & scientific fallacies I’ll point out further in an upcoming post. I have been on 3 different DMARDS and 3 biologics without any results. Pain, swelling, tenderness, joint and muscle pain, fatigue that doesn’t seem to end and brain fog. I tested seropositive from day one. My Rheumy has even tried me on Cymbalta to see if it would help. Well it helped alright, helped in making my skin feel like I was being electrocuted when even the slightest breeze blew across my skin. I’ve tried not eating certain things, eating certain things, adding supplements and everything else without any result. Why must I always be the one that does everything the hard way? I just asked my Rheumatologist if my expectations were too high. Will be trying a new DMARD, my 4th. Methotrexate didn’t work. I thought maybe I was expecting too much from the medication he said his goal is pain free and he believes we can try medications and medication combos until we achieve it. Praying that is true! I was wondering what happens if a person is on multiple medications for RA & still has pain? Are meds like lortab not recommended? I am writing in regards to my adult son who was diagnosed with JRA @ age 6yrs. I also have a question regarding mental illness. Can RA contribute to it or the medications prescribed? Can it cause imbalances in the brain? What happens depends on the doctor. Pain meds like Lortab are prescribed by some rheumatologists, but others say it shouldn’t hurt that much or they refer patients to pain specialists. I have not heard of brain imbalances being caused by rheumatoid disease / RA. However, having JRA could be very traumatic and it could contribute to other problems.